Here's a hearty side dish that's the perfect companion for steaks, roasts, chops, poultry, and seafood. You can almost smell the delicious aroma of the potatoes and rosemary as you read through the ingredients. Best of all, this dish is good for you. Although potatoes are starchy, that doesn't make them unhealthy. It just means you have to watch your serving size. Potatoes are a good source of vitamin C, calcium, magnesium, potassium, folate, and fiber and are almost fat-free. This recipe uses a little olive oil, which in small amounts is good for your heart. Your starchy foods should take up about a quarter of your plate, leaving plenty of room for green and colorful vegetables and a protein source. Wash the potatoes and allow them to dry. You don't need to peel the potatoes, but you may wish to cut out the eyes or any surface blemishes. Baby potatoes may be left whole, but large potatoes should be cut into 2-inch pieces. 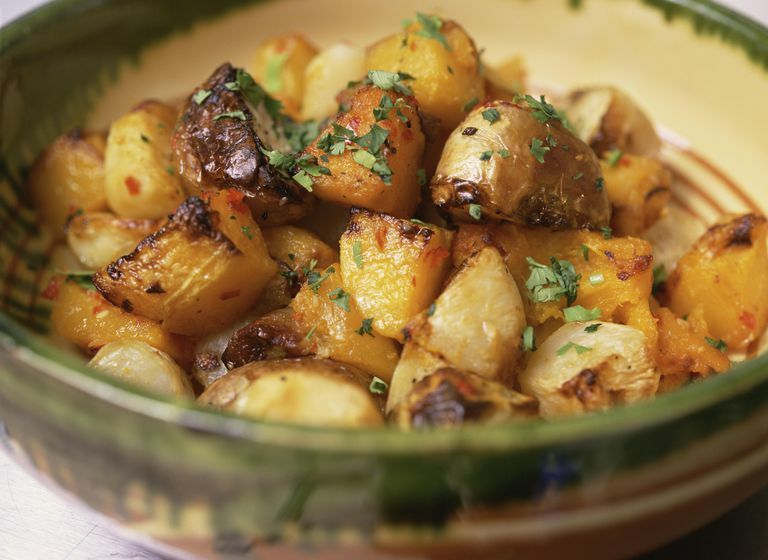 Place the potatoes in a baking dish and drizzle the olive oil over the potatoes. Add rosemary, garlic, salt, and pepper. Toss the potatoes with a large spoon until the potatoes are coated with the oil and seasonings. Roast the potatoes uncovered for 45 minutes to one hour. Turn the potatoes occasionally during the cooking time. The potatoes are done when the flesh is soft and easily pierced with a fork. You can use thyme or oregano instead of rosemary, or a combination of your favorite herbs. These are ready to serve just the way they are, but you might want to add a little ketchup or hot sauce at the table. Choose potatoes that are firm and don't have a green tint. Greenish potatoes contain solanine, which has a bitter flavor. Oven roasted potatoes are a great addition to vegetarian meals as well. Serve these potatoes with a big helping of Swiss chard and some black beans or chickpeas.